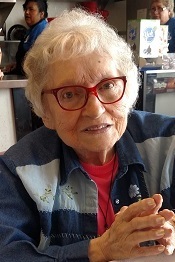 Margaret Taylor, 87, passed away June 30, 2018. Margaret was born and raised in Kansas City, MO. She is survived by daughter Deborah Taylor, son Dennis Taylor and grandsons Shane Williams, Joshua Williams and Gunnar Williams. She was preceded in death by her husband of 49 years, Milton Taylor and daughter Pamela Williams. Since her marriage, she and Milton resided in Independence, MO. After raising her children, Margaret worked and retired from the Internal Revenue Service. Visitation will be 6-8PM, Thursday, July 5, 2018 with services 1PM, Friday, July 6, 2018, both at Park Lawn Funeral Home, 8251 Hillcrest Rd. ; burial in Memorial Park Cemetery. In lieu of flowers, the family requests donations to Maywood Terrace Living Center for their kindness, support and on-going care; Maywood Terrace Living Center, 10300 E. Truman Road, Independence, MO 64052. Our heart aches for family at the loss of Momma Taylor. She was a wonderful wife, Mother and friend and will be sadly missed by all who knew her. We will truly miss Margaret, our condolences go to the family. She was truly a loving and kind woman. She was the joy of our church services. Our love and prayers are with the family. We will truly miss your sweet smile. She was very caring and loving. Always had a positive word to say. I will miss all our special times we had together. We will miss you in our Thursday night church service. Our condolences to the family. Thank you for sharing your loved one with us. She will truly be missed but never forgotten.